Rock fishing from Point Lowly marina. Connecting with nature, catching a meal, relaxing or just for the thrill of it; Whyalla is renowned for great fishing in the bountiful Spencer Gulf waters of Eyre Peninsula. Eyre Peninsula is known as the Seafood Frontier of South Australia. Whyalla waters offer a multitude of sea life species, great memories with families and friends and delicious meals for lucky anglers. Catches of tommy ruff (Australian herring), garfish, whiting and squid can be had, especially on the rising tide. Blue swimmer crabs are often caught in the warmer months. Between spring and autumn, the beach is a popular spot for crabbing at low tide. The blue swimmer crabs are easiest to catch at low tide and as the tide turns to come in. Squid jigs can only be used on the eastern side of Point Lowly, the best times are autumn and winter but squid catches occur all year. Rare large kingfish are a prime target from the rocks using floating baits of squid, live fish or pilchards. Whyalla is a boaties paradise for many different species – garfish, snook, tommy ruff, snapper and whiting. Whyalla is the home of Australia's best red snapper fishing with ‘big reds’ in excess of 15kgs being caught. King George whiting may be found on sand patches along the coast close to shore. Frozen bait, ice and some basic tackle is available from most service stations. Fishing and boating outlets cater for fishing and boating needs. With an area of about eight hectares, a depth of 2.4 metres at low tide, 32 floating moorings for vessels up to 13 metres, pile moorings for an additional 36 vessels, a floating service jetty, and a four-lane boat launching ramp, the marina has provided access to some of SA's best fishing grounds. 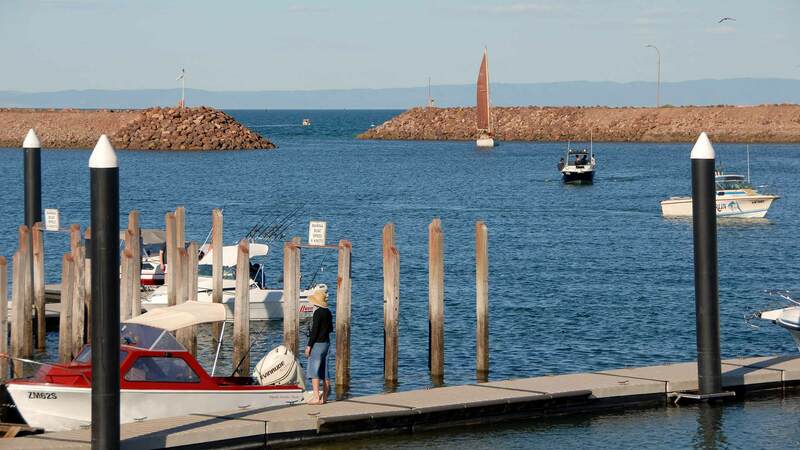 It is also home to the clubrooms of the Whyalla Yacht Club, Whyalla Sport Fishing Club, Whyalla Boat owners Association and Whyalla Sea Rescue. A launching fee applies at the boat ramp to assist with ongoing maintenance. Access to the launching area is controlled by a ticket machine. Ph. + 61 8 8644 0414 or call on radio (27mg88 UHF16) for weather updates or assistance.